Ryan and Meghan first met when they were in high school, but luck brought them back together years later when Meghan moved into a shared home where Ryan just happened to be living. The two hit it off and have been inseperable every since. Having a DC engagement session was really important and special to them because Ryan proposed at the Lincholn Memorial and the two grew up near the area. The morning of Ryan and Meghan’s engagement session was one of the coldest I have experienced so far in the area. It was also rainy and dark, but you would never know that by looking at their pictures! The cherry blossoms photographed beautifully and their love for one another shows through. 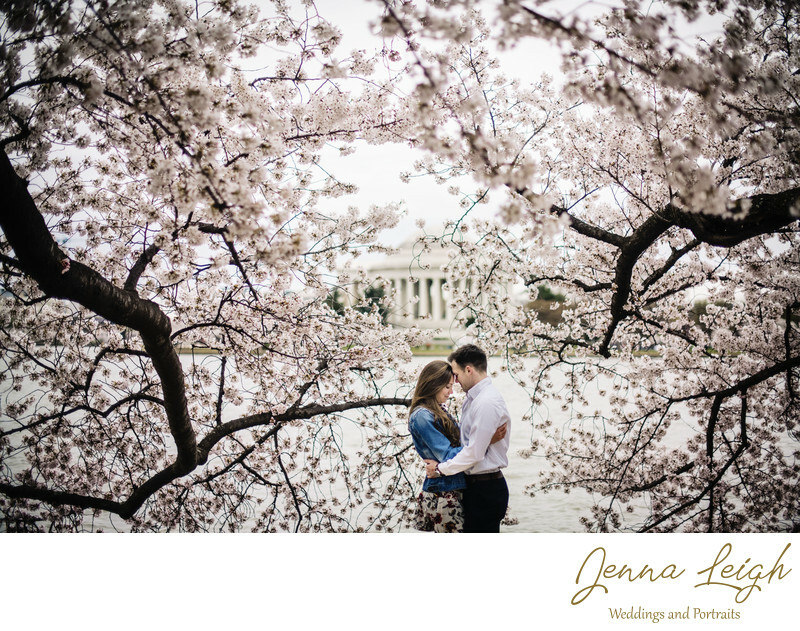 They braved the cold, and we were able to capture some amazing memories in their favorite city and at the beautiful Washington D.C Tidal Basin. Location: East Basin Drive SW at Jefferson Memorial, Washington D.C., DC.